It was a film presentation following this year’s Afrikamera motto African woman on and behind the screen. 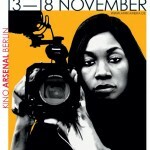 On Friday evening, six film makers from Kenya, Tunisia, Algeria, Cameroon, Senegal and the DR Congo presented their short movies in the Arsenal-Filmhaus in Berlin. The series of films included pieces from several genres. Among them were animated films from Tunisia and an Afro-Futurism film from Kenya. The guests followed an interesting program including a discussion with two of the film makers, Nadia Rais and Cécile Mulombe. The evening was opened by the Kenyan production Pumzi produced by Wanuri Kahiu, an Afro-Futurism film taking place in Kenya’s Kikuyuland. Pumzi simulates a period of enormous drought and water shortage during which people are kept in a closed up city complex under the ground. A young scientist tries to escape the closed up surrounding in order to start her search for life in the outside world. Heavy background music provided the film with an enormous sense of emotions ending in the main character planting the very last seed outside the complex in the desert, paying with her life. Other films from Tunisia and Algeria dealt with North African states’ struggles during the Arab Spring. While film maker Nadia Rais from Tunisia used animated film methods to throw a light on the country’s situation, in Yasmine et la révolution Karin Albou shows a young woman from Algeria who participates in demonstrations in France, promoting the ongoing revolutionary activism in her home country. She experiences what political activity means, expressing her dissatisfaction with the fact that protesting women were not accepted until then. The spectator gets a short but interesting and sometimes funny insight into the young activist’s life as a protester. Angèle Diabang Brener from Senegal in Mon beau sourire needs five minutes to illustrate how young women undergo a ritual of getting a traditional tattoo above their upper teeth, which is supposed to symbolize their transistion into adulthood. In a painful ceremony an elder woman colors the younger’s gum. Compared to the other films, this short scene, though provided with intense drumming music in the background, is rather a documentary. With a contribution from Cameroon and France, Pascale Obolo in La femme invisible shows a young black woman wandering around Paris looking for faces from her community on film posters. She is trying to discuss the invisibility of a black woman in a white western society. On the one hand, the movie might be seeing cinema as a reflection of the existing world. On the other hand it illustrates how the African cinema in particular is heavily underrepresented and out of the world focus. Other films presented during the evening were Tout le monde a des raisons d‘en vouloir à sa mère from the DR Congo and L’Mrayet from Nadia Rais, Tunisia. All in all the guests got an interesting insight view into movies made by women about women. While the genre of documentary illustrated an existing ceremony, other movies were rather fictional and quite abstract. Particularly the animated films from Nadia Rais were interesting to watch but difficult to retrace. Besides that, the evening underlined the enormous underrepresentation of female movie makers in the international movie business. Particularly in many African countries, there are many aspiring and ambitious film makers, both men and women, who are waiting to find a platform in order to present their work to a wider public all around the globe.